Over the last several years, Bob Terhune has been contacting our friends overseas who were AFS foreign exchange students at South Bay high schools in 1958-59 and 1959-60. Bob, who attended MCHS in 1956-57 and was in the group that graduated from Aviation High in 1960, reunited Renzo Ferraris of Italy (MCHS '60) with Lucien Vallet of Switzerland (AHS '60). A photo of that reunion is on The Mustang Neighborhood, page five. Bob later connected with Cynthia Dowling Harvey of New Zealand, the other exchange student at MCHS in the Class of 1960. Bob and his wife Shirley visited New Zealand in 2015 but they were unable to get together with her then. However, a letter from Cindy is below with a reply from Renzo. 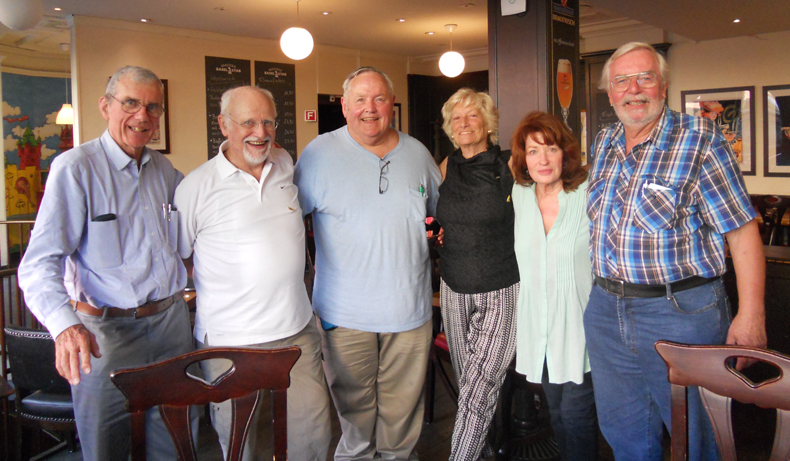 Later Bob and Shirley organized a reunion for former South Bay area exchange students in Basel, Switzerland in 2016. Immediately below is a photo from the Basel reunion and a letter from Janeane (Jan) Hendrick Moody to Patty Innerbichler DeBellis (MCHS '59) All of these people were either exchange students or hosted exchange students about 60 years ago. In this photo, taken in Basel, Switzerland, in August, 2016, a group of South Bay exchange students and members of their host families got together for a reunion almost 60 years after AFS brought them together for the first time. They are (from left): Lucien Vallet, Switzerland, Aviation, 1959 - 1960; Jacques Rohner, Switzerland, Mira Costa, 1958-1959; Bob Terhune, host brother to Lucien, Aviation 1959-1960; Maria dos Santos, Portugal, Mira Costa, 1958 -1959; Janeane (Jan) Hendrick Moody, host sister to Joern, Mira Costa, 1959 - 1960; and Joern Koch, Germany, Redondo, 1959 - 1960. Thanks to Bob's wife, Shirley for taking this photo. From: Bob Terhune, American Host Family “Foster Brother” at Aviation High School of Redondo Beach, California in 1959-60. Several of us from the late 1950s and early 1960s of the South Bay Chapter of AFS are getting together in Basel, CH from Tuesday, 9 August thru Thursday, 11 August 2016. We are seeking AFS alumni, students and host family members from that timeframe, from those high schools or from nearby, such as Torrance or Palos Verdes schools in southern California, to join us for an “AFS Rendezvous”. It is intended to be very informal, just a chance to get together and exchange experiences and stories. We will meet in front of the City Hall at the Marktplatz in Basel at 09:00 on 9 August. Specific “Missing Persons” we are trying to locate: Ragnhild Neilsen of Denmark. Attended Redondo Union High School 1959-60. Elfriede Ryhlick of Manhattan Beach, California. A Female French Student from Pau, France. Attended Mira Costa High School 1958? A Male Student from Iceland. School ? Year ? A Female Cambodian Student, Terry Thong?. Attended Rolling Hills or Palos Verdes High School 1959-60. Eva Jonsson (Rosander) of Charlottenberg, Sweden. Attended Redondo Union High School 1960-61. A Male Student from Turkey. Attended Redondo Union High School in 1960-61. American “Host Family” Brothers and Sisters are also invited. Action Requested: Please search your records. If you know of any of the above AFS Alumni or of any others who would like to join us, please pass this information along to them. Thank you. As these AFS reunions brought together a growing circle of friends from long ago, Janeane (Jan) Hendrick Moody wrote this letter to Patty Innerbichler DeBellis (MCHS'59), who was an AFS exchange student in Italy during the summer before her senior year at Mira Costa. Hoping by now you have experienced a safe and happy landing back home in PA! My ankle is getting better, thank you. Shirley Terhune just had a knee replacement, so I guess both of us are on crutches for a while. I'm very happy for your quick and lovely response. The AFS experience also changed and greatly enriched my life. It brought me many new connections and re-connections, and now, here you are again after all these years. While working long projects all over the world, Joern and his family made their permanent home in a small village in Greece. In 1984 I bought a simple 100 year old house there. From this came wonderful Greek friends. New friends from an annual German summer beach encampment near his village led to several visits throughout the years by German families to our home, and trips to Germany to stay with their families, plus visits with them to Salzburg and Praque. Over time, Ian (my Australian husband of 34 years) and I drove through and enjoyed Germany, Austria, Switzerland, and Italy on our way to Greece. Daughters of the German beach campers came to live with us and go to local high schools. I found local host families for 29 Japanese university students, took them on field trips, and taught them ELD (ESL) classes, and my family continued to host exchange students while my two daughters were in high school (one was an exchange student). Two very dear German couples who have homes in Germany and Greece, came to visit us twice and flew with us to stay in our Mexican casa that Ian built with local labor. (It's in a non-touristy coastal fishing and agricultural pueblo on the mainland, one hour north of the Pacific port of Manzanillo.) Joern and I visited them in Germany after the 2016 reunion in Basel. Joern's son, Harry, married a young Greek woman, and we, and several members of my family, went to their traditional Greek wedding, with musicians leading the groom's party through the village. 1500 guests had a banquet on the lawn below Joern's home, and dancing, both traditional and modern, was still going when I fell asleep at 4:00 A.M.; a big fat Greek wedding indeed. Joern now has two delightful grandsons. The family moved to northern Germany due to Harry's work, and I enjoyed their hospitality before returning to San Francisco after the Basel reunion. Ian and I live in a house Ian built in Sausalito, on the S.F. Bay just north of the Golden Gate Bridge. My two daughters and three grandsons live close by, and Ian's son lives across the bay with his two little boys. My grandsons are 19, 16, 10, 4, and 1 year old. I retired as a teacher and educator, mostly in high school and middle school, after 31 years. I loved teaching! Well, you don't meet many Janines! Mine has an unusual spelling. How is yours spelled? Another coincidence: Joern and I have the same birthday. He is two hours younger. My dear AFS friends, This is a summary of the last 50 years since we were all together in LA. At 19 years I met my husband to be Ian Harvey, a good looking young man,and a very good golfer.At twenty years I got married and a year later had a little baby girl, Nicola. Settled into being a home maker and 7 years later adopted a beautiful baby boy, Martin. Worked on various committees including local AFS and served on selection panels for several years. Taught sunday school, ballet and guitar, so I was kept busy. We have 3 grandsons , 1 at university, 1 a builder and 1 still growing up, and now 12 years old. We have had a wonderful ongoing friendship with the Saunders family, with many visits on both sides of the Pacific Ocean. Ian and I toured parts of England , Ireland and Europe 14 years ago. Would have loved to have seen all of you then. We did catch up with Yani ( Indonesia) when we visited the Rhylicks in California about 20 years ago. I believe Rhany ( Denmark) married an American but don't know anything else. Special thoughts to Renzo, A Fellow Sausage! Remember? love to all, Cindy (Dowling) Harvey Shirley and Bob could you please forward this letter to Renzo, Lucien, Joern, Jan, and Wayne, much appreciated. Renzo.Ferraris@gmail.com: Renzo and Marina Ferraris live in Genoa, have 2 adult sons who are both married and they now have 2? Grandchildren. Renzo, a consulting engineer, is still working part-time. Shirley and I visited him in 2007 and again last year, 2013, with Lucien. Lucien.Vallet@hotmail.com: Lucien, never married, lives in Basel, Switzerland. He is retired from Novartis, a pharmaceutical company, where he was a Patent Attorney. We have seen each other a number of times over the years, both in the U.S. and in Europe. jandimoody@gmail.com: Janeane (Jan Hendrick) Moody was a Senior at Mira Costa High School (MCHS) the year her family hosted Joern Koch of Hannover, Germany, who attended Redondo Union High School (RUHS) in 1959-60. Jan and her Australian husband, Ian, live in Sausalito, across the Golden Gate Bridge, north of San Francisco. I re-connected with Jan while searching for you. Koch.Joern@gmx.net / skype: Koch.joern: Joern & Karin Koch live in Pteleos, Greece. He worked as an economist for the E.U., the UN, Bull General Electric and the World Bank in Iran, Liberia, Indonesia, New Guinea, Chile, Paraguay, Turkey, Macedonia, Crete and Estonia. www.MCHS60.com: This is the website of the Mira Costa Class of 1960. It has lots of information, names, emails, photos, stories, etc. Even though I graduated from Aviation High School, just about everyone in my class attended Mira Costa when we were Freshmen, for our first year of high school, before Aviation High was built. So I recognize quite a few of the folks at Mira Costa. Wayne Overbeck (e: woverbeck@Exchange.Fullerton.edu) is a retired college professor who is sort of the administrator of the website. I hope I have not bored you with too much information. Again, thank you for getting in touch and we hope to see you in April 2015. ....Now there's this follow-up from Renzo Ferraris, telling about the last 50 years of his life! First of all special thanks to Bob, for the continued effort to reunite us all! A brief summary for my side, for those I haven't met recently. A mechanical engineering, I established a management consulting firm happily run by my people while now I spend most of my time playing golf (badly). Am now a engaged in a venture called Metrocargo aimed at increasing transportation of containers by rail rather then road, unsuccessfully so far. Married 44 years to Marina we have two sons, a cardiologist and a dentist, and 4 grandsons aged 1 to 8. Cindy, especially glad to be in touch with you again. Any recent news of Anne and Peter Ryhlick?